So remember how I was complaining about how if I wanted to download a backup ebook file from BN.com, it would automatically download .pdb files for Mac users when the new Nook doesn't even read .pdb files? At the time I mentioned that it might be a glitch they’ll fix eventually either on the website or the Nook itself. Well, they've fixed it on the BN.com website. 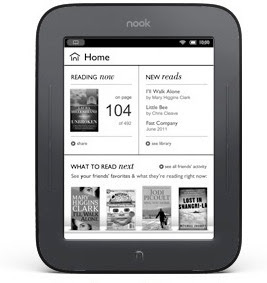 Now when I download a backup copy of my purchased Nookbooks, they download as .epub files. Yay! I did complain about it, but now I miss the .pdb files a little because if I read ebooks on my computer, I vastly prefer using the eReader app rather than Adobe Digital Editions or the Nook for Mac app. ADE is too limited--I can't change font size or style, for example--and Nook for Mac takes forever to load on my computer. However, now that I have my Nook touch, I can just read the books on my Nook anyway, so I don't know why I'm missing the .pdb files. I'm such a whiner.